Dynamic Pricing: Is The Price Tag Legacy Coming To An End? 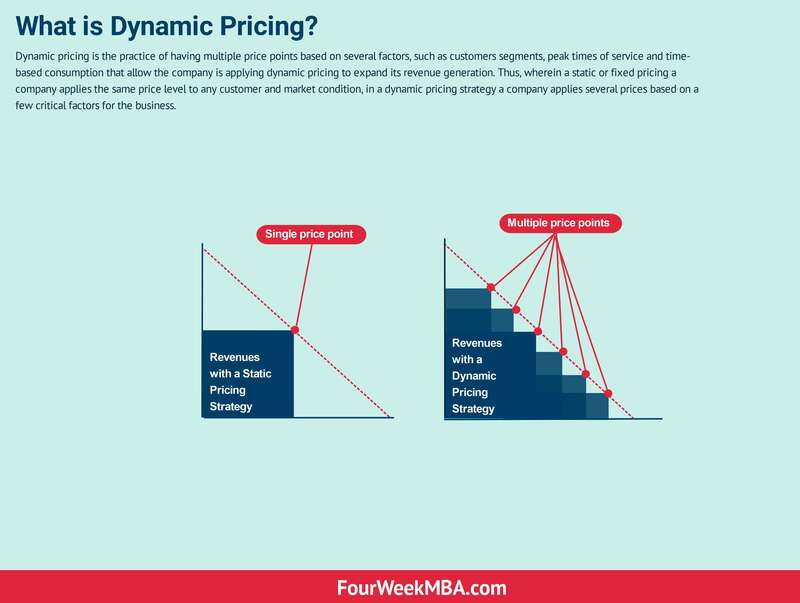 Dynamic pricing is the practice of having multiple price points based on several factors, such as customers segments, peak times of service and time-based consumption that allow the company is applying dynamic pricing to expand its revenue generation. Thus, wherein a static or fixed pricing a company applies the same price level to any customer and market condition, in a dynamic pricing strategy a company applies several prices based on a few critical factors for the business. Today we go to any store find a price tag and assume that is the value of that item we’re purchasing. There’s no question asked, neither interaction in many cases with the clerk. Yet there was a time when price tags didn’t exist. Finding the origin of things is always hard. Before the 19th-century price tags didn’t exist. In other words, before buying anything you needed to bargain and haggle with the clerk to finalize the purchase. When price tags got introduced, they did represent an incredible innovation. Indeed, stores could finally manage more inventories with fewer clerks. That’s because clients needed to walk to the clerk ask for price and after haggling, a bit agree on the purchase. This might have been time-consuming in terms of the clerks required to manage the inventories, the training needed to have clerks know the price ranges, and what was allowed. And the time it could take to customers to bargain the price. As price tags have become the norm, where the same prices are applied to anyone, we find it odd when on the web the same thing changes in price. In many cases, we look for a flight ticket, which price is different, an item on a popular e-commerce platform that according to where and when we browse shows us a slightly different price. This makes us wonder whether the era of price tags is over in favor of what is called dynamic pricing. Also, many dynamic pricing strategies are already used in many of the products or services you might buy. It’s just that you don’t realize that. Dynamic pricing is the practice where prices for goods or services change based on several factors. Think of the case in which there is a surge in demand for a service (Uber for example), and the price of it rises accordingly. Therefore, there are certain times of the day or certain periods where the same service or item can be sold for more. Also, at a certain interval of time, the demand for a service might be higher. Think of the case of more people trying to purchase a ticket for a concert which might drive price up. As fixed prices have become the norm after the 19th century, people often wonder whether dynamic pricing is legal. Yet it is when price discrimination depends on economic factors that are affected by demand and offer. In other cases, if price discrimination might be based on gender, race or religion that becomes illegal. Think of the case in which you enter a store to purchase a coffee an pay $2. Yet a person enters the same coffee shop and purchase the same coffee for $1. Would you feel good about it? Chances are you’d feel ripped and perceive the so-called dynamic pricing as a fraud. Think of a different scenario. You’re purchasing an item on e-commerce, that item price is set according to several factors. The algorithm that drives the offering on the e-commerce platform has quite some data about your behavior, spending habit, it knows your location, and it knows the time of purchase. Based on all those variables it determines the price of the good you’re buying. You would perceive it as all done algorithmically and automatically by a machine, which is not thinking. You might perceive it as a technological advancement. Besides, if you don’t feel like to buy, you can see quite the e-commerce and get back when and if prices are lower. The fact that technology nowadays allows platforms to embed algorithms makes it easy for those companies to leverage dynamic prices and makes it easier for consumers to accept this practice. How can you apply dynamic pricing to your business? If you’re evaluating dynamic pricing for your business, then it makes sense to understand whether your business model might be better off with this approach. For instance, do you serve several segments that have entirely different budget levels? Think of a company that serves both consumers or business clients. The former will have a budget that is way lower compared to the latter. In that case, you can achieve higher revenue by simply repackaging your product or service in a different format. Therefore, for the customer segment with the highest budget, it might make sense to have your service at a certain time of the day. Thus the price for that segment will be higher. In other cases, your product or service might have peaked. Think of the case of more people consuming electricity at a certain time of the day. Based on simple demand and offer electricity will cost more. Think also of a coffee shop for which customers purchasing from the early hours of the morning are willing to pay more. You can create a fast track that makes the price higher for those customers. Think also of the case of e-commerce that does business around the world. In certain countries (like the US and Canada) the value of the service is higher and the spending ability as well. Therefore, based on the IP of the user accessing your store prices will change to reflect local spending habits.